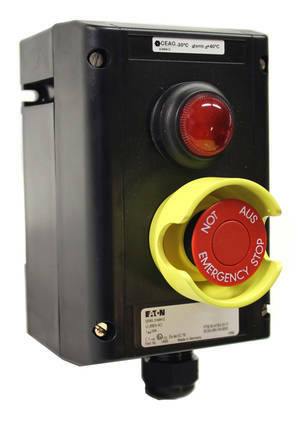 SCB 5 DL is an illuminated mushroom pushbutton intended to operate our Man in Cold Room Alarm, SCA 1 AL. The button has a sturdy metall frame that protects the mushroom pushbutton against breakage. It is well suited for use in harsh environments. SCB 5 DL consists of a pushbutton, one normally open and one normally closed Contact, and an LED indicator mounted in a plastic enclosure. • Push button locks in the depressed position. • Resets by pulling the button. 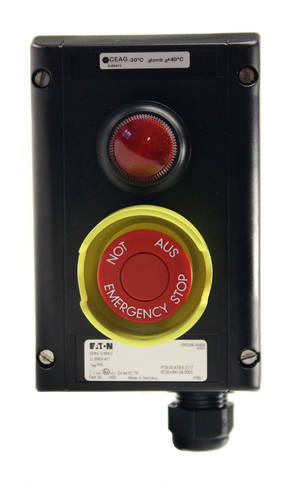 • Yellow metal frame, red button and light, black plastic encapsulation. • Ex II 2 G.